When you’re searching for a vehicle that can actually handle the deep waters of the rivers you visit, the rough terrain in the backwoods and the tough rids on a variety of grades, the ArgoAvenger 8×8 ST is a vehicle that’s made to handle everything you can throw at it. No longer do you have to carry your deer back to the truck through the woods or water or bring all your camping gear with you in backpacks, you can use the Argo and get your stuff where you want with ease. The Argo Avenger 8×8 ST is just what it sounds like. This is an Extreme Terrain Vehicle that has eight wheels that power through the sand, snow, swamps, and any other terrain you can toss its way. The 30 horsepower Kohler V-Twin liquid cooled engine is attached to the Argo Admiral Transmission to give you the drive you need and the ability to carry anything you need to the location that makes the most sense for you. This vehicle is built to bring up to 1070 pounds of cargo and equipment along with you to where you need to go. In order to protect you when the terrain is truly extreme, the Argo Avenger is built with a body that’s made from a high-density polyethylene material that’s engineered to keep water hazards out and the environment you choose in. The smooth and durable underbody can float over items that could cause the vehicle to stop if it used a different style and appearance for your driving and outdoor experience. 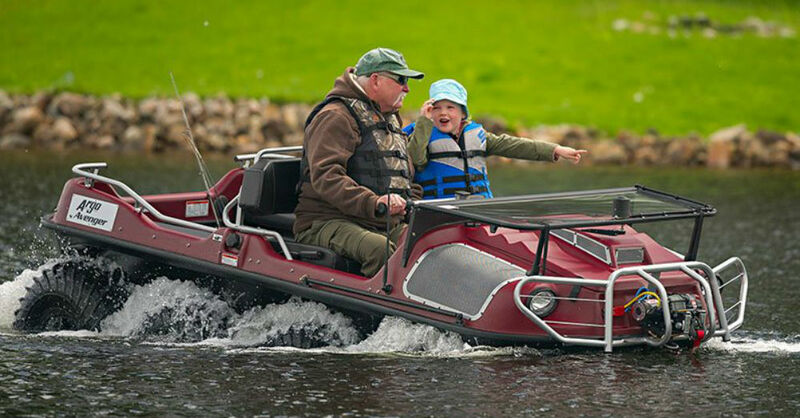 This Argo is a lot of fun for you to have the adventure you want in the wilderness. Riding where you need and making it back to your origin is important when you choose the Argo Avenger. This model is built with and uses custom low-pressure tires that allow the vehicle to handle the ride in an amphibious manner to provide the superior traction needed when you head out for some off-road adventures. These tires give you more of what you want when you take out for a drive and that means better grip on the terrain and the reliability you need to bring you home again. The Argo Avenger 8×8 ST is one of the Argo models offered at Jeff Schmitt Lawn and Motorsports. Make your way to this location and let the expert team help you figure out which version of the Avenger is the right one for you. You’ll be able to head out on the trails and trample through the wilderness with ease after you make your way to the dealership and choose the model that’s right for you today.